If Baltimore gets hit with a major snowstorm again, my colleague Brit Ryle is one guy I wouldn't mind getting locked in the office with. He's smart. He's down to earth. And he always does the dishes — even when they're not his. What's not to like? You see, for years now we've been going back and forth over investing in gold. When you're talking to a gold bug, this is much like arguing with a priest about religion — it is a daunting task. But no matter how hard Brit beats me over the head with his arguments, they just don't sink in. In regards to gold, my opinion is — and has been — a whole lot closer to that of Warren Buffett than to King Midas. "Gold gets dug out of the ground in Africa, or someplace. Then we melt it down, dig another hole, bury it again and pay people to stand around guarding it. It has no utility. Anyone watching from Mars would be scratching their head." I am in my 35th year as a CPA and financial adviser to high net worth individuals. Years ago I would have agreed with your assertions. Today I say keep a minimum cash balance and go long gold and silver in large percentages. Now first of all, I'd like to thank David for reading and for writing. Because the truth is I welcome others' opinions, even though I may not always agree with them. After all, I never said I had a crystal ball. And when it comes to Investing in Gold, there is literally noone on the planet that I trust more than Greg McCoach. His full report on how to Invest in Gold is below, it's a must-read for ANY investor. So you are interested in investing in gold or gold-related stocks and profit from the rapidly rising bull market, but you have a limited budget of only $5,000. The first thing you need to ask yourself before taking on this venture is: Why am I investing in gold? The answer to this question should be your guide to the right style and types of gold investments for you. You see, there are many different kinds of gold and gold-related investment options for investors today. These include physical bullion, ETFs, stocks, futures, forex, cash, bonds, etc. For example, futures contracts — generally considered to be one of the most speculative arenas in the investment marketplace — really need to be monitored hourly, and are only significantly profitable to the top percentage of speculators. In fact, something like every 9 out of 10 investors that enter the futures market goes home a loser. With this in mind, I'm going to recommend the easiest-to-manage, least speculative, and most basic ways to play the gold market in this report today. Back to why you want to invest in gold right now. Most investors, however, are looking to both financially gain and hedge against any crises; but they tend to lean to one side of these two major gold investment philosophies. To which side do you lean? Depending on your own individual outlook beliefs, investment philosophies and style, decide where you fall on the scale. Personally, I lean slightly to the hedging (safety) side of investing in gold — but I still want to make a lot of money along the way. I would put myself somewhere around the fifth dot from the right on the scale above. Now, I'm not here today to try to influence your thinking in either way; rather, the goal of this report — and for all of Angel's financial advisory services, for that matter — is to help you maximize your investment goals in alignment with your own personal investment philosophies. In this report, I will give you three generalized gold investment portfolio allocation ideas that offer easy-to-manage and well-diversified approaches to investing in gold with only $5,000. The first two portfolios will reflect both extremes of the main gold investment principles mentioned above. The last will be a balanced gold investment portfolio. Within each portfolio, I will consider three broad gold investment vehicles including physical gold bullion, gold stocks, and cash, and tell you how I believe $5,000 would be best allocated. So let's get started with the gold safety portfolio. The goal of this portfolio is to provide an investor with a financial hedge against any economic, political, social, or currency-based crises with an easy-to-manage and diversified portfolio of gold and gold-related investments. While every type of investment will by nature have some degree of risk, this gold safety portfolio has significantly lower risk than the gold profit or balanced portfolios that we'll talk about in a few minutes. However, it's important to remember that a potential lower reward is usually sacrificed for lower risk. Since this portfolio represents the extreme safety side to investing in gold, it will be very heavy with physical gold and cash, but will still diversify slightly into gold production stocks. If you're looking for safety, physical gold bullion is definitely for you. In this gold safety portfolio, I am allocating a full 70% of the total investment to physical gold bullion. I recommend over 50% of this to be in the form of the actual physical gold metal, either bars or coins. However, because you'll only be able to buy a few ounces with a limited budget, I recommend buying the much smaller 0.50, 0.25, 0.10, and 0.05 ounce coins. While it is admittedly much less convenient to hold physical bullion this way, I prefer these smaller coins because they offer more options when it comes time to sell or trade them in. And if it ever comes down to it, you'll be able to barter more effectively with the smaller gold coins. Physical gold bars and coins can be purchased from many online brokers including Kitco and AmeriGold. These brokers always charge a little over spot prices. Shop around for the best prices. Gold ETF shares, such as streetTRACKS Gold Shares ETF (ticker symbol: GLD) and iShares COMEX Gold Trust (IAU), also represent physical gold bullion. These ETFs offer much more liquidity than actually holding the physical metal. Because of the higher liquidity, I recommend adding a little ETF exposure to a gold safety portfolio: 10% or 15% should be good. With so much invested in physical bullion, there's little room for investing in stocks, which have been traditionally more risky than owning the physical metal. Gold exploration stocks are too risky for this investing strategy. However, gold production stocks offer lower risk and attractive profits in times of rising gold prices. For a maximally safe portfolio, I believe that 10% of the total investment should be sufficient. Since gold prices have traditionally countered movements in the value of the U.S. dollar, a cash investment to take advantage of rising gold prices should be done in countering currencies such as the euro, yen, and pound sterling. The Canadian dollar is also a great liquid hedge against a falling U.S. dollar — and is probably the best bet for a physical cash investment for Americans. For this gold safety portfolio, I recommend allocating 10% of the total investment in Canadian dollars. Allocate the other 10% on currency ETFs. One of the more popular currency ETFs for gold bulls is the PowerShares DB U.S. Dollar Bearish Fund (UDN). This fund is based on the U.S. Dollar Index, an index that tracks a weighted performance of the euro (57.6%), Japanese yen (13.6%), British pound (11.9%), Canadian dollar (9.1%), Swedish krona (4.2%), and Swiss franc (3.6%). The goal of this portfolio is to provide an investor with an easy-to-manage and diversified portfolio of gold and gold-related investments that is both very aggressive and profit-seeking. This is the "high-risk/high-reward" portfolio. Since this portfolio is essentially going after the most money in the shortest possible time, it will be very heavy with gold exploration stocks, which can skyrocket after a company makes an initial gold find. Gold prices can sometimes significantly swing (although rarely over 4%) in either direction in a given day. I would still have some physical gold bullion exposure in a profit portfolio. However, because of its relatively low liquidity, the actual metal is probably not best to have in a profit portfolio. So for a gold profit portfolio, I would stick to the gold ETFs — like streetTRACKS Gold Shares (GLD) or iShares COMEX Gold Trust (IAU). 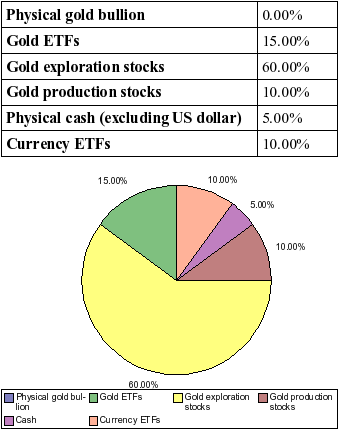 I suggest 15% of the total investment for a profit portfolio to be in Gold ETFs. Gold stocks are the real meat and potatoes of a high-risk/high-reward profit portfolio, especially gold exploration stocks. Gold exploration stocks, which should constitute 60% of the total investment in a profit portfolio, are stocks of companies that are currently looking to discover gold on their properties. As I just mentioned, the stocks can often skyrocket as a company finds gold. So at the end of this report, I'll give you some information on where you can find help choosing exactly which gold exploration stocks are best to be in. I also recommend allocating another 10% of your total investment to gold production stocks. These are stocks of companies that have mines and facilities that are producing and selling gold. Gold production companies can also be significantly affected by new gold discoveries as well as jumps in spot gold prices. Again, since gold prices have traditionally countered movements of the U.S. dollar, a cash investment to take advantage of rising gold prices would best be done in other currencies. For ease of investing, I recommend having a bit more of a cash investment in the currency ETFs like PowerShares DB U.S. Dollar Bearish Fund (UDN). The goal of this portfolio is to provide an investor with an easy-to-manage, highly diversified, and well-rounded portfolio of gold and gold-related investments. Studies and mathematical models have shown that maintaining a well-diversified portfolio will yield the most cost-effective level of risk reduction. You'll notice that the balanced portfolio isn't evenly weighted and is slightly more focused on stocks. This is due to liquidity issues and the nature of risk associated with the different gold investments. 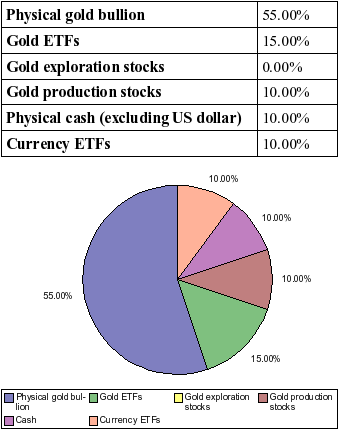 In a well-balanced gold investment portfolio, gold stocks account for 45% of the total portfolio, while physical bullion and cash represent 25% and 30%, respectively. In a balanced portfolio, a physical gold bullion investment should be split between the physical metal and gold ETFs. Again, physical gold can be purchased from many online brokers including Monex, USA Gold, Kitco, and AmeriGold. You may want to put a bit more into the gold ETFs, such as streetTRACKS Gold Shares ETF (GLD) and iShares COMEX Gold Trust (IAU), because they offer much more liquidity than actually holding the physical metal. Another great well-balanced precious metal fund is the Central Fund of Canada (CEF), which is backed by both physical gold and silver bullion on a secure basis for the convenience of investors. 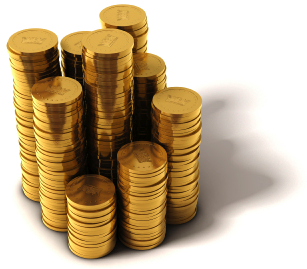 Unlike the gold ETFs, the shares of the Central Fund of Canada also pay a small dividend. A nicely balanced gold equities portfolio will also include a good mix of gold companies ranging from tiny nano-cap exploration firms to large global blue chip conglomerates. I recommend holding a bit more of the gold production stocks because of their higher stability. You may want to consider Van Eck Associates' Market Vectors Gold Miners ETF (GDX), which provides targeted exposure to 34 companies worldwide involved in mining for gold or silver ore, representing a diversified blend of small-, mid- and large-capitalization stocks. In a balanced portfolio, I recommend splitting a cash investment between physical cash and currency ETFs. As I mention a minute ago, I believe that a cash investment in the Canadian dollar is the best bet for Americans. And again, one of the more popular currency ETFs for bearish U.S. dollar investing is the PowerShares DB U.S. Dollar Bearish Fund (UDN), based on the nicely balanced U.S. Dollar Index. 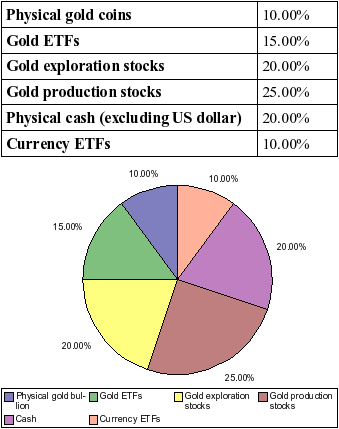 I recommend allocating 30% of a gold balanced portfolio to cash, excluding the U.S. dollar. Geopolitical instability is just one of the catalysts preparing the launch gold prices into the stratosphere. In an interview on Wednesday, President Trump seemingly signaled he was also prepared to wage a currency war. The outlook for gold in 2017 is extremely bright. Prices are expected to continue rising. Wealth Daily editor Luke Burgess explains 10 reasons why. A cheap and environmentally-friendlier way to mine for gold is the future.